Matt Mayberry, a former NFL linebacker for the Chicago Bears, is currently one of the most read columnists for Entrepreneur Magazine, as well as an acclaimed keynote speaker, consultant and peak performance strategist. 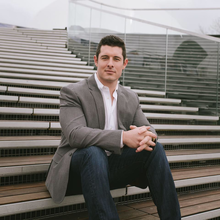 As the CEO of Matt Mayberry Enterprises, a training and consulting company, he specializes in maximizing the performance of individuals and organizations all over the world. Matt is Indiana University’s current record holder for most sacks in a single game and was the team recipient of the prestigious Howard Brown Award, which exemplifies leadership, courage and work ethic. With a 4.45 forty yard dash, Mayberry was signed by the NFL Chicago Bears in 2010. Reaching the pinnacle of his sport, he suffered a life-changing injury. It was this event that inspired Mayberry to embrace his true passion—his true gift—helping others achieve massive success by learning how to turn failures into gifts. As an in-demand keynote speaker, Matt is known for his innovative ideas on how to dominate, turn failure into gifts, improving sales effectiveness, and elevating human potential. Matt delivers keynote speeches with a strong focus on delivering actionable ideas and strategies designed to maximize business and personal performance. He addresses tens of thousands of men and women each year – on the subjects of peak performance, overcoming adversity, motivation, culture, and teamwork. Growing numbers of people are taking notice of Matt Mayberry. His clients include major corporations, Fortune 500 companies, NFL and NBA teams, government, civic and nonprofit organizations, professional associations, hospitals, and universities. Matt is extremely passionate about creating an unforgettable experience for every audience that he speaks to. He inspires audiences with a combination of powerful stories, current research, and past experiences from his own life and athletic success that resonate long after each event comes to an end. Attendees leave every event with a detailed and specific action plan for applying their new ideas once they get back into their own routine. Matt has been rated one of the top speakers at every event he’s keynoted. Throughout his career, he has been featured on numerous media outlets including NBC, Fox News, Business Insider, MSN Lifestyle, Fox Business, ABC, and ESPN to name a few. A partial list of his clients include Fifth Third Bank, USA Hockey, DuPont, Union Pacific Railroad, and Lowe’s. Matt is writing his first book, Winning Plays, planned for release in September 2016. He currently resides in Chicago, Illinois. His personal interests include sports, fitness, golf, reading, the arts, spirituality, and spending time with his family and friends.